Twitter is about to cut up to 336 jobs out of its 4,100 employees working for the company around the world. It represents around 8.2 percent of the company’s global workforce. Jack Dorsey, who just became full-time CEO again, shared the news in an email sent to the Twitter team. He also shared this email with the SEC. Re/code reported today’s layoffs last week, saying that engineers would be the first people impacted by the layoffs. In particular, Dorsey wants a leaner company in order to iterate more quickly on the product. The company launched Moments last week, a new tab in the mobile app for casual users. It lets you scan through stories. Each story is a compilation of the most important tweets, pictures and videos on a particular topic. This lean-back experience is apparently only the first one. “We launched the first of these experiences last week with Moments,” Dorsey wrote in his email. The structure of the company is going to change a bit after the layoffs. While the engineering team will be smaller, it will still represent the biggest team of the company. Twitter has a growth problem. It seems like the company is stuck when it comes to monthly active users. While 316 million active users is a huge number, the stock market is looking for growing companies. And this is probably one of the main concerns for the board, as well. 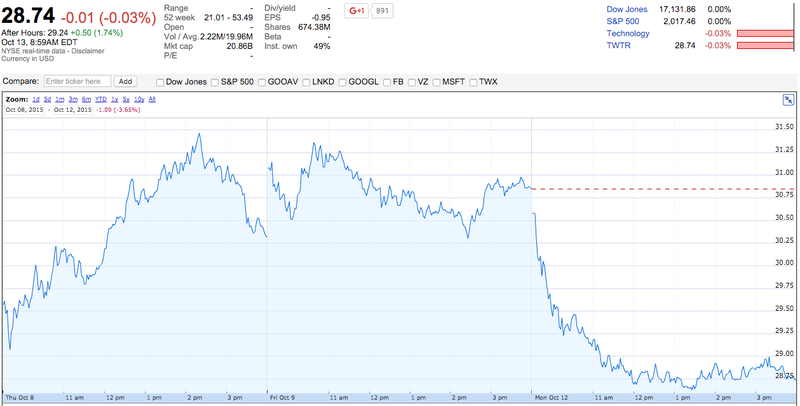 Twitter shares (NYSE:TWTR) are now up 1.74 percent in the premarket compared to yesterday’s closing price of $28.74. We are moving forward with a restructuring of our workforce so we can put our company on a stronger path to grow. Emails like this are usually riddled with corporate speak so I’m going to give it to you straight. The team has been working around the clock to produce streamlined roadmap for Twitter, Vine, and Periscope and they are shaping up to be strong. The roadmap is focused on the experiences which will have the greatest impact. We launched the first of these experiences last week with Moments, a great beginning, and a bold peek into the future of how people will see what’s going on in the world. Let’s take this time to express our gratitude to all of those who are leaving us. We will honor them by doing our best to serve all the people that use Twitter. We do so with a more purpose-built team, which we’ll continue to build strength into over time, as we are now enabled to reinvest in our most impactful priorities. Thank you all for your trust and understanding here. This isn’t easy. But it is right. The world needs a strong Twitter, and this is another step to get there. As always, please reach out to me directly with any ideas or questions.